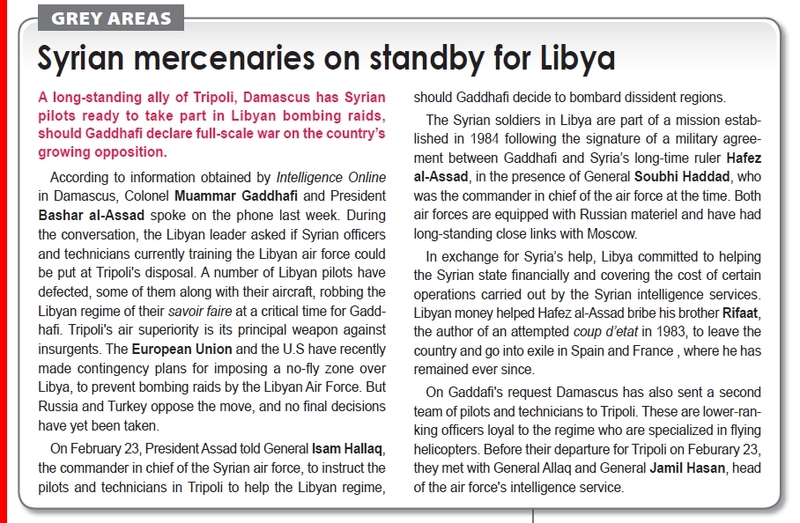 Home > Libyan uprising, Syria in the media	> Is Syria secretly supporting Gaddafi? I must admit I had not heard of any recent links between the two countries, eg visits of presidents, rhetoric from Gadaffi praising Syria, or of Assad praising Libya etc – can you give some more evidence of this? Is that the only hole you can pick in my argument? That’s pretty poor. Malik – I wasnt aiming to undermine your arguement. You may be right. You are saying that Syria and Libya are close allies. I am asking you to prove it. Seems reasonable, no? Many thanks for your article. It is great to hear a loud clear fearless voice of truth for a change! Many people know very well Syria’s security dirty deals with the Libyan regime and it depends on what type of evidence one would need to prove such a link. Of course the authorities in Syria are now very frightened. If the Libyan dictator goes then the Syrian dictator(s) will go too. It about time to wake up people of Syria!you have the final say and it is only you who can make it happen. It is enough… more than enough. I think the evidence for Syria supporting Gaddafi has become conclusive, especially after Syria decided to vote against the no fly zone over Libya in last week’s Arab League meeting. Also, the people of Benghazi have already made up their minds. During a demo in the city yesterday (Saturday), protesters carried placards saying:يا بشار يا جبان دز جنودك للجولان which translates as: Bashar you coward send your soldiers to the Golan! Ok, I will give you a confirmed thing..Gaddaf-al Dam(blood squirter) who is Gaddafi’s cousin and trustee and was head of the Libyan/Egyptian relations committee travelled to Damascus from Cairo in the Early days of the revolution.. I am not sure of the date, 2Osomething February?. It was quite a short visit, I believe lasted for no longer than 2 hours and he returned to Cairo. Of course that doesn’t prove anything and if Syrian rgeime is actually ‘lending’ fighters and pilots but it is indeed a very fishy visit at a critical time. Thank you Ihab for posting the video. Conclusive evidence I think of Assad’s collusion with Gaddafi. Mnny Syrians I have spoken to are ashamed of their country’s role in supressing the revolution in Libya. This collusion will only inflame anti-regime feeling in Syria as the protest movement seems to be getting off to a start there.